Chicago Bullsguard Rajon Rondo fired back to Jimmy Butler and Dwyane Wade one day after they called out their teammates following a loss to the Atlanta Hawks. "My vets would never go to the media. They would come to the team. ... My goal is to pass what I learned along. The young guys work. They show up. They don't deserve blame. If anything is questionable, it's the leadership," Rondo wrote on Instagram. "My vets would never go to the media. They would come to the team. My vets didn't pick and choose when they wanted to bring it. They brought it every time they stepped in the gym whether it was practice or a game. They didn't take days off. My vets didn't care about their numbers. My vets played for the team. When we lost, they wouldn't blame us. They took responsibility and got in the gym. They showed the young guys what it meant to work. Even in Boston when we had the best record in the league, if we lost a game, you could hear a pin drop on the bus. They showed us the seriousness of the game. My vets didn't have an influence on the coaching staff. They couldn't change the plan because it didn't work for them. I played under one of the greatest coaches, and he held everyone accountable. It takes 1-15 to win. When you isolate everyone, you can't win consistently. I may be a lot of things, but I'm not a bad teammate. My goal is to pass what I learned along. The young guys work. They show up. They don't deserve blame. If anything is questionable, it's the leadership"
The post included a photo of Rondo with former Boston Celtics teammates Kevin Garnett and Paul Pierce. Wade and Butler ripped into their team after Bulls' Wednesday loss to the Hawks, a game they were leading by 10 points with 3 minutes left in regulation. "I don't know what happened," Wade said. "But we continue to be in these kinds of situations and lose games like this. Everyone don't care enough. You got to care enough man. It's got to mean that much to you to want to win. And it doesn't. So I don't know what happened. I don't know how you fix it. It just doesn't mean enough to guys around here to want to win ballgames. It pisses me off, but I can't be frustrated and I can't care too much for these guys. That have to care for themselves. You got to do better. You got to do better with knowing where your shot's coming and knock them down. You got to do better with knowing film, knowing personnel. Just as a team, just got to do better, man." Wade and Butler, who combined for 73 points on the night, had a clear message they wanted to get across in their postgame comments to the media. The pair walked out of the showers together and knew exactly what they wanted to say. When asked if this loss was debilitating to the Bulls, Wade said he wasn't sure. 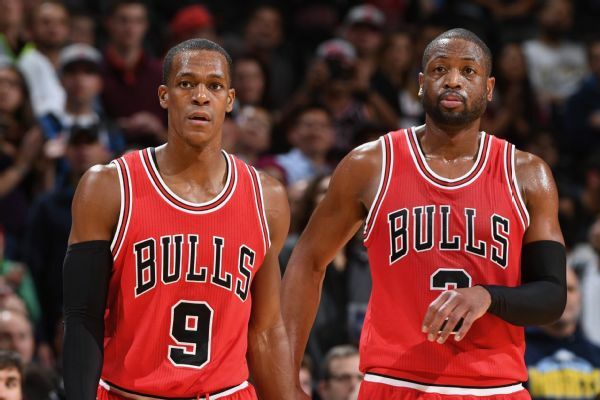 Both Butler and Wade are hopeful that this loss lights a fire under the rest of their teammates. But they aren't sure if it will. The Bulls, who fell to 23-24 after Wednesday's loss, will face Wade's former team, the Miami Heat, at home Friday night.